Many communities in Westchester owe their existence to a quirk of geography--a protected harbor on the Hudson River, a former aboriginal campsite or the junction of two major stagecoach roads. 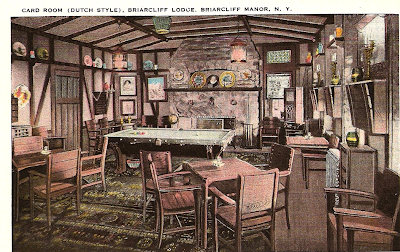 The village of Briarcliff Manor owes its existence to one wealthy patron: Walter W. Law. Law, the father of Briarcliff Manor, was born in 1837 in the English town of Kidderminster. In the 19th century, the name Kidderminster and carpets were synonymous. Its carpet weaving began as a cottage industry, but the introduction of steam power paved the way for the huge carpet mills that would make Kidderminster a center of carpet manufacture in Britain. One of ten children of a dealer in carpets and dry goods, Walter William Law left school and began working at the age of 14. In 1859, he decided to immigrate to the United States. Leaving England with a few letters of introduction from his father to friends in the American carpet trade and with enough money to last him only about two weeks, Walter Law arrived in New York on January 22, 1860. It was a Sunday, and the passengers could not clear customs until the next day. Young Walter Law landed a job as a traveling carpet salesman. It lasted until he discovered his employer was misrepresenting domestic rugs as imported and charging premium prices for them. His next employer folded when the Civil War caused a general business slowdown. A call on William Sloane, head of the firm of W. & J. Sloane, resulted in his being hired, more out of kindness than need. Sloane, his new employer, had started his working life as an apprentice weaver in Edinburgh. In 1834, after his employer failed to reward him for inventing a new method of weaving tapestry rugs, Sloane had immigrated to New York. With his brother John, they established a carpet business as W. & J. Sloane. Their little store on Broadway across from City Hall prospered. William Sloane’s sons took over the business from their father on his death in 1879. Seven years earlier, one son, 28-year-old William Douglas Sloane, had married Emily Thorn Vanderbilt, Commodore Cornelius Vanderbilt’s 20-year-old granddaughter. According to newspaper reports, the groom “got $15,000,000 by the performance. Mr. Sloane himself is worth many millions in his own right.” Seventy years later, her granddaughter, Alice Frances Hammond, would marry jazz musician Benny Goodman. In 1882, the Sloane store moved uptown to an ornate six-story building on the southeast corner of 19th Street and Broadway, where the firm sold carpeting, oriental rugs, lace curtains and upholstery fabric, later expanding to furniture. Fittingly, the Sloane building today again houses a carpet store, ABC Carpet. Across Broadway from W. & J. Sloane was the massive Arnold Constable dry goods establishment. Opposite Sloane’s on 19th Street was the eight-story retail building housing the Gorham Manufacturing Company, famous for its silverware and metal work. A block north, at the southwest corner of Broadway and 20th Street, was the Lord & Taylor dry goods store. The neighborhood of fashionable dry goods stores and other landmark buildings lies roughly between 14th and 27th streets and 5th and 7th avenues. Called the “Ladies’ Mile Historic District,” its 440 memorable buildings are now preserved and protected. Young Walter Law increased the business of Sloane’s wholesale department by securing the account of the Alexander Smith & Sons Carpet Company in Yonkers for the manufacture of moquette carpets. These tufted, high-pile carpets produced on power looms invented by Halcyon Skinner quickly displaced the popular flat-weave, reversible carpets. They also undercut pricier hand-knotted carpets. The giant Alexander Smith carpet mills in Yonkers along Nepperhan Avenue were named the Moquette Mills. Their architecturally important workers’ row housing was built in stepped fashion on the hill adjacent to the factory. Law and his wife, Georgiana Ransom Law, moved to Yonkers, making it easier for him to service the Smith account. Here they raised their two sons and four daughters. In 1890, health problems forced Walter Law at age 53 to take early retirement from the Sloane firm. Tuberculosis was given as the cause. Unhappy with the prospect of inactivity, he sought a new venue for his talents and ambition, and turned his attention to northern Westchester. Then as now, the benefits of fresh air and outdoor living were recognized as important weapons in fighting infectious diseases like tuberculosis. The newly-retired executive found the 236-acre farm of James Stallman between Old Briarcliff Road and Pleasantville Road for sale. He snapped it up in 1890 for $35,000. The Stallman farmhouse, originally used by Walter Law as an office, later became the rectory of St. Theresa’s Roman Catholic Church. When he bought the Stallman property, it was already named Briarcliff Farm. 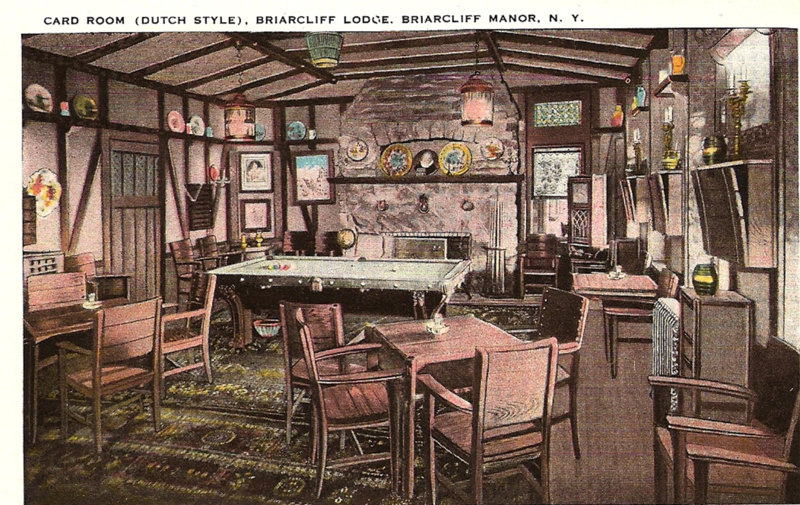 The term Briarcliff came from “Brier Cliff,” a name applied by the Rev. John David Ogilby, professor of ecclesiastical history at the General Theological Seminary in New York City, to his Westchester summer estate. Once when traveling in England, Dr. Ogilby had come upon the parish church at Bremerton, near Salisbury. Desiring to improve property he owned near Ossining, he donated the land to the community and retained architect Richard Upjohn to design a church inspired by the church Ogilby had seen in Britain. Upjohn was the architect of many churches in New York City, the best known of which is Trinity Church at the head of Wall Street. Construction of All Saints Church in Briarcliff Manor began in 1848, but Dr. Ogilby died in 1851, well before its completion in 1854. The original structure, illustrated in the Rev. Robert Bolton’s 1855 History of the Protestant Episcopal Church in the County of Westchester, was a simple rectangular building with a steep, gabled roof and a small, open, wood belfry. Swiftly adding additional acreage, Law made some 40 purchases in the next ten years. By the turn of the century he owned more than 5,000 acres in Westchester. Walter Law was acutely aware of the connection between milk and the spread of infectious diseases like tuberculosis. His Briarcliff Farms would specialize in the production of certified milk from tuberculin-tested Jersey cows. Other farm animals included chickens, pigs, sheep, pheasants and even a few peacocks. At its height, Briarcliff Farms boasted some 300 workers. Law’s Briarcliff Dairy processed 3,000 to 4,000 quarts of milk each day, as well as quantities of cream and butter, shipped to New York by an early morning milk train on the Putnam Division. 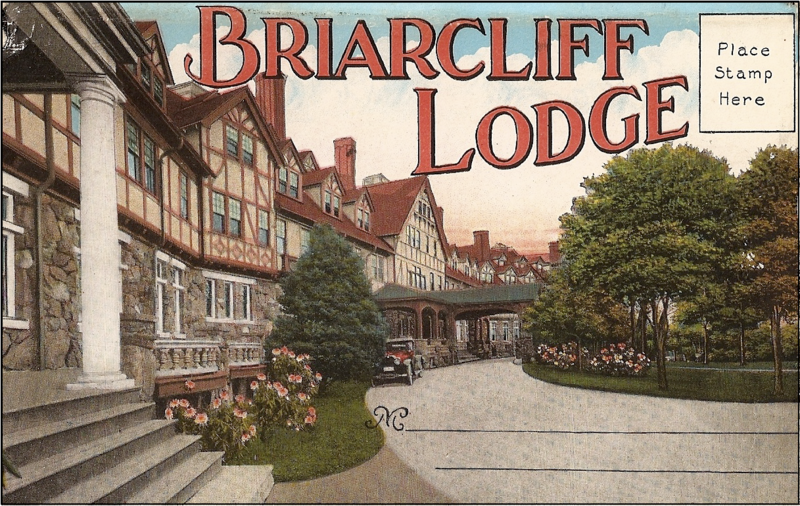 Briarcliff Farms had its own farm store in the Windsor Arcade at Fifth Avenue and 46th Street in the city. Later, Law opened another store at 2061 Seventh Avenue near 125th Street. This uptown location was intended to tap the burgeoning new fashionable neighborhood of aristocratic apartment houses and popular single-family brownstones springing up in Harlem, linked to downtown by elevated and subway lines. Walter Law had the Midas touch. Indeed everything he touched turned to gold. With so much land available for cultivation in Briarcliff Manor, it was inevitable he would turn to the raising of flowers. 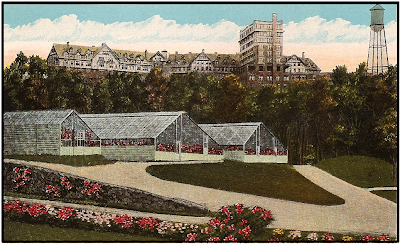 Erecting steam-heated greenhouses that eventually covered 75,000 square feet, he undertook the growing of American Beauty roses and other flowers on raised beds for the florist trade. A greenhouse foreman discovered and propagated the pink Briarcliff Rose, an improvement over the existing strain. It was registered with the American Rose Society and became extremely popular. Flower sales eventually reached $100,000 a year. It was an easy next step from certified milk to pure water. Law’s Briarcliff Table Water Company’s wells tapped aquifers 250 feet deep, and it offered bottled water in individual bottles and large jugs complete with office-style dispensers. The water was available in Briarcliff Farms stores in New York City and at food markets throughout Westchester and as far away as Lakewood, N.J.
As Walter Law’s “empire” grew, the need for municipal services became obvious. He proposed incorporation. One problem: The village would lay in two towns, Ossining and Mount Pleasant, a permissible spread under law, and in two school districts—a requirement of state law. He got signatures from 25 freeholders on a petition requesting approval for the proposed incorporation. On September 2, 1902, the supervisors of the two towns met with the freeholders to discuss the details of the incorporation. An election followed ten days later. Everyone who voted was indebted to Walter Law, either for a house or livelihood or both. The result was resoundingly favorable. 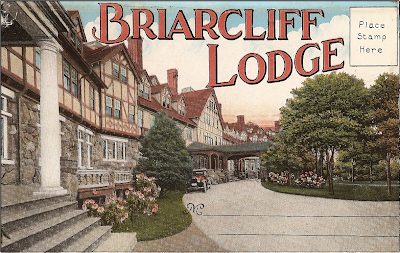 The incorporated village of Briarcliff Manor officially came into existence on November 21, 1902, with William DeNyse Nichols as president. (This title for the heads of incorporated villages was later changed to mayor.) Successive mayors who were long-serving members of the Law family included Walter Law’s son, Walter W. Law, Jr., who served from 1905 to 1918, and Henry H. Law, who served from 1918 to 1936. The hamlet of Scarborough was annexed to Briarcliff Manor in 1906. From the beginning, an unusual system was employed for selecting candidates for the village’s public offices. The system, now formalized by law as the “People’s Caucus,” allows any eligible citizen over 18 years of age to seek nomination for office. Effectively keeping national politics and national party names out of the system, candidates chosen by the caucus are almost guaranteed election. It may come as a surprise, but the earliest steam locomotives built in the United States were assembled in the lower Hudson Valley. Between 1830 and 1832, a half-dozen railroad engines were constructed by the West Point Foundry at Cold Spring, N.Y., located about seven miles north of the Bear Mountain Bridge, and shipped to various parts of the country. The presence of this industrial enterprise in Putnam County was one consequence of the War of 1812. During that conflict, sources of heavy weapons were in short supply. Two foundries, one in Georgetown in the District of Columbia and the other in Pittsburgh, were major suppliers of cannons to the military and naval forces of the young republic. The British seizure of Washington shut down the Georgetown foundry. No large foundry existed anywhere in the northeastern portion of the new nation. Unhappy with the imbalanced weapons procurement system and the limited number of reliable foundries, after the peace treaty of Ghent was signed in 1815 Congress passed the Army Reorganization Act. This legislation changed the method of buying arms and ammunition. Hereafter, the government would work more closely with suppliers of heavy weapons, even advancing funds for equipment and prepayment of orders. It was the beginning of a close relationship that would eventually grow into the military-industrial complex President Dwight Eisenhower would later warn about. The West Point Foundry was the brainchild of Gouverneur Kemble, eldest son of prosperous attorney and merchant Peter Kemble and scion of a wealthy New York family with roots going back to Dutch Governor Peter Stuyvesant. A Columbia College graduate, he started in the business world as a mercantile agent. In 1811 and 1812, he served as U.S. Consul at Cádiz in Spain, where he had the opportunity to study the Spanish government's technologically advanced processes for casting cannon. During the Barbary Wars, he was assistant naval agent to Commodore Stephen Decatur. negotiating the release of captured American seamen. While abroad, he studied the best European iron technology for manufacturing cannons in existence at that time. His expertise in this field no doubt contributed to his decision to establish the West Point Foundry. In 1817, along with partners--mostly friends and relations from other wealthy New York families with names like Gouverneur, Brevoort and Renwick--Kemble assembled a consortium of ten investors to be called the West Point Foundry Association to produce artillery pieces and other items. Incorporated on April 15, 1818, in Albany and capitalized at $100,000, among the initial investors in the foundry was U.S. Army Gen. Joseph G. Swift, the first graduate of West Point in the class of 1802, which numbered only two cadets. The second cadet in the class was Simon M. Levy, a Jew from Baltimore. Gouverneur Kemble’s brother William would be the Association’s sales agent, headquartered in New York City. Another partner, William Young, an ironmaster from Belfast, Ireland, was named the Association’s first foundry superintendent. The site for the foundry near the hamlet of Cold Spring, N.Y., was selected because of its proximity to sources of iron ore in what is today’s Clarence Fahnestock State Park in Putnam County and in Orange County across the river. Nearby were ample hardwood forests from which the charcoal needed in the smelting process could be made. A swift-flowing stream, Margaret’s Brook, running through the site was an added advantage. Despite the lack of local ironworkers and skilled craftsmen, the West Point Foundry’s business grew, thanks to immigration. Soon the foundry was manufacturing steam engines for steamboats, gears, water pipes, and other cast iron products, in addition to heavy artillery. Railroad and canal fever was infecting the country. In Charleston, South Carolina, the South Carolina Canal and Railroad was chartered to tap burgeoning upcountry cotton plantations. The new line would link the port city of Charleston with Hamburg, S.C., 136 miles to the northwest. After devising a wind-propelled railcar and a locomotive powered by a horse on a treadmill, both of which were unsuccessful, the railroad company decided to order a locomotive from the West Point Foundry in New York at a cost of $4,000. The transaction was a first for both parties. The foundry had inspected and tested the British Stourbridge Lion upon its arrival in New York in 1829 and had built several steamboat engines. Featuring a vertical boiler, the locomotive, named the Best Friend of Charleston, was shipped to Charleston. On Christmas Day in 1830, with cannons firing salutes from the first car, the four-ton locomotive pulled five coaches carrying 141 festive local citizens. Eschewing the comfort of one of the carriages, a third person shared the open operating deck of the locomotive with the engineer and fireman. He was the line’s new chief engineer, Horatio Allen--the same Horatio Allen who had so bravely driven the Stourbridge Lion a year earlier in its first run in Pennsylvania. According to an account in the Charleston Courier, the passengers "flew on the wings of wind" and the engine "darted forth like a live rocket, scattering sparks and flames on either side." It marked the first commercial use of a locomotive built in North America. Six months later in the evening of June 17, 1831, the Best Friend of Charleston was making her way through the lush South Carolina countryside outside of Charleston pushing a flat car covered with a thick bed of sand. On it was a cast-iron brazier in which pine knots burned brightly. This primitive “track illuminator” marked the first use anywhere of a railroad engine headlight. Annoyed by the high-pitched whistle of the safety valve, the fireman tied down the valve lever. After a few minutes of quiet, the locomotive set another record. The resulting tremendous explosion made it the first locomotive to blow up in North America, and left a badly scalded engineer and wood passer. A South Carolina Railroad mechanic named Julius Petsch took the mangled remains of the Best Friend and put them together so ingeniously the railroad named him its "Master of Machinery," the first American to bear this title. The rebuilt locomotive was appropriately renamed Phoenix. The railroad announced that hereafter a "barrier car" would be placed between the engine and passenger cars. "Loaded with six bales of cotton," the railroad's advertisement said, "it will protect travelers when the locomotive explodes," a sentiment that could have hardly offered much reassurance to passengers. In the meantime, another locomotive, the West Point, the second railroad engine built by the foundry for which it was named, had been delivered and was put into service. The West Point was a significant improvement over the Best Friend. It had a horizontal boiler that gave it greater clearance in passing under bridges and overpasses.The line to Hamburg was completed in 1833 and would become the first link of the future Southern Railway, which built a replica of the Best Friend of Charleston train in 1928 and exhibited it throughout the South. The replica Best Friend of Charleston train is temporarily on loan to the Norfolk Southern Railway and displayed in their office building in Atlanta. Its permanent home is Charleston in the Best Friend of Charleston Museum at The Citadel Mall. The opening of the Erie Canal in 1825 brought prosperity to the entire Mohawk Valley and soon attracted the attention of bankers and Wall Street. By 1831, the Mohawk and Hudson Railroad Company, with Stephen Van Rensselaer as its titular head and John Jacob Astor as a director and major stockholder, completed the 16-mile rail line linking Albany and Schenectady. Among its officers and investors were names well known in the world of finance, including Jay, Fish, King, Stuyvesant and Schuyler. One obvious reason for building the Mohawk and Hudson line was the series of more than a dozen locks in the Erie Canal between Schenectady and Cohoes, the canal's eastern terminus. These caused interminable delays for canal travelers between the two cities. The DeWitt Clinton of the Mohawk and Hudson was the first steam locomotive to operate in New York and the third locomotive built by the West Point Foundry. It was named in honor of the governor of New York responsible for the Erie Canal and who had died in 1828. Designed by Adam Hall, a West Point Foundry mechanic, and John B. Jervis, legendary engineer from the Delaware and Hudson Canal, the 3-1/2-ton locomotive lacked a few needed refinements, most notably a spark catcher in the smokestack. On August 9, 1831, a distinguished group of New Yorkers, including New York governor Enos Throop, members of the legislature, and the mayors of Albany and Schenectady, found seats within or on top of three bright yellow stagecoach bodies that had been converted into railroad coaches. Fortunately, the long strips of leather riveted together that served as springs on stagecoaches had been retained and gave railroad passengers a gently rocking ride. Unfortunately, the coaches were loosely coupled by heavy chains. Following a stagecoach custom that would become an early railroad custom, conductor John T. Clark sounded a loud blast on a tin horn to signal departure. Engine driver David Matthew, also from the West Point Foundry, opened the throttle. The locomotive started with a jerk that threw the front seat passengers in the coaches into the laps of the passengers across from them. Some hastily installed pieces of fence rail were added to stiffen the link between the coaches. Passengers who elected to ride atop the coaches had an even rougher ride. As the locomotive gathered speed, sparks and embers from the smokestack showered down on them. A stop at a water tank to take on water mercifully gave the rooftop passengers the opportunity to wet down their smoldering hats and garments. It was a maiden trip everyone would remember. Upon its return to the capital, the De Witt Clinton was shipped to back to the West Point Foundry for reworking. On April 19, 1847, the Mohawk and Hudson’s name was changed to the Albany and Schenectady Railroad and folded into the New York Central Railroad. The New York Central built an operational reproduction of the DeWitt Clinton, complete with three carriages, for the 1893 Columbian Exposition in Chicago. This replica is now on display at the Henry Ford Museum in Dearborn, Michigan. So much attention is paid historically to the Hudson as an artery of commerce and travel we often forget the Hudson Valley was the birthplace of the American railroad. The thriving sloop and steamboat traffic on the river had one significant disadvantage: It came to a halt in the winter when the river froze. The power of steam was first demonstrated in England, where steam-driven pumps had long kept British coal mines free of water. And in 1803 Richard Trevithick had built and demonstrated the first locomotive on the tracks of a tramway in southern Wales. Several railroad pioneers played key roles in bringing steam locomotives to the Hudson Valley early in the nineteenth century. The first was Col. John Stevens, a visionary engineer and inventor, and a distinguished veteran of the Revolutionary War. In 1812, Stevens published a pamphlet with a ponderous title, Documents Tending to Prove the Superior Advantages of Railways and Steam Carriages over Canal Navigation. This first-published American work on railroads predicted locomotives could be built that would reach speeds of 50 miles per hour and perhaps even twice that speed. According to Stevens, rail transportation costs would one day be cheaper than those of canals. Stevens was no stranger to steam propulsion. He had already built two successful steamboats: the Phoenix in 1809 successfully ventured out on the open ocean, and the Juliana in 1811, a steam ferry for the New York to Hoboken run. In 1815, Stevens obtained from the New Jersey legislature a charter to build a steam railroad from New Brunswick to Trenton. Unfortunately, he was a better engineer than salesman. At a time when U.S. policy was to invest a growing government surplus in canal-building projects, Stevens could not raise the necessary capital for a rail line. When Stevens learned in 1825 that a 26-mile-long railroad had been built between Stockton and Darlington in England, he became convinced of the soundness of his idea. On his estate in Hoboken--now the site of the prestigious Stevens Institute of Technology--he constructed a 630-foot circular track. Over this he ran an experimental one-cylinder steam engine that powered a cog wheel meshing with a centered toothed rail. The two wooden running rails were covered with strap-iron. Stevens's engine, called by him a "Steam Wagon," traveled over the track at speeds of up to 12 miles per hour. Its vertical boiler's pressure reached an astonishing 500 pounds per square inch. His railroad idea was a case of bad timing. At that moment some 500 cannon, spaced within earshot of one another, were poised to relay news from Buffalo to New York City that the Erie Canal had been completed. During the country's canal-building mania, promoters conceived the Delaware and Hudson Canal to link the Hudson with the Delaware River. The impetus for this venture was New York City's desire to replace wood as a source of fuel with anthracite coal from northeastern Pennsylvania. Anthracite burned cleaner and cost half as much as wood. The problem lay in getting the shiny black chunks over the Catskills to the Hudson River. The company was set up on March 8, 1825, with Philip Hone as president, Benjamin Wright, builder of the Erie Canal, as chief engineer, and John B. Jervis as his assistant. Jervis had begun his career as an axman clearing brush for surveying parties on the Erie Canal but quickly assumed more responsibility. He would succeed Wright as chief engineer of the Delaware and Hudson two years later. On July 13, 1825, citizens of Ulster, Orange and Sullivan counties met at the summit of the watershed along what is today Route 209, between Ellenville and Wurtsboro. With enthusiastic songs, prayers and speeches, canal digging began. Canal company president Hone was the featured speaker. Later that year, after being appointed Mayor of New York City, he resigned as president under the pressure of mayoral duties. After some three years of labor by 2,500 workmen, the canal was completed. To conserve scarce capital, it terminated at Dyberry Forks in Pennsylvania, seven miles short of the originally planned terminus. The mines still lay 16 miles to the west, behind the formidable barrier called Mt. Moosic. Jervis devised an ingenious system of inclined planes to bring the loaded coal cars over the mountain. The community that sprang up at the canal terminus took its name, Honesdale, from Philip Hone, who in April of 1823, with several investors from Orange and Sullivan counties, had formed the Delaware and Hudson Canal Co. 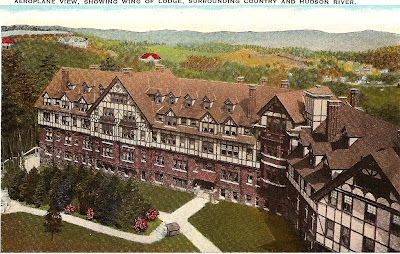 When novelist Washington Irving visited the burgeoning settlement, he suggested that it be named Honesdale to honor his friend. In return, Hone playfully gave the name Irving Cliff to a steep ledge of rocks overlooking the town.
. By the time the canal was completed, the company's funds were nearly exhausted. The directors sought aid from New York State. Its canal-friendly legislature granted the Delaware and Hudson a loan of a half million dollars, taking a mortgage on the canal right of way and voting the company the privilege of borrowing $300,000 elsewhere. A rail line was surveyed from Carbondale, the town that had sprung up around the mines, to the canal terminus. Like other industrial "railroads," the initial plan called for the use of horses as motive power on level sections of the line. Coal from mines near Carbondale moved by rail to Honesdale, where it was transferred to barges for the 108-mile journey to the Hudson. In October 1828, the first barge, carrying only ten tons of coal--the channel still needed deepening--began its trip to Kingston. Here it was loaded aboard sloops and transported to New York City. A New York newspaper reported on December 10, "The sloop Toleration arrived this day from Kingston with a cargo of coal, the first fruits of the Delaware and Hudson Canal." The D and H was a financial success from the start. Farsighted John Jervis was convinced that a locomotive would be better than horses or mules for hauling coal to the canal. In the fall of 1828 he persuaded the directors to send 26-year-old Horatio Allen, a company engineer, to England to inspect and purchase locomotives. Allen visited Robert Stephenson and Co., in Newcastle-upon-Tyne in England and found a four-coupled locomotive, The Pride of Newcastle. Allen purchased it on the spot, asking only that its name be changed to America before being shipped. At Foster, Rastrick and Co., engine builders in Stourbridge, Allen ordered three locomotives: The Stourbridge Lion and two others to be named Delaware and Hudson. Shipped from London in November, the America arrived in New York on January 15, 1829. Perplexingly, its name then disappears from company records. The Stourbridge Lion arrived in New York City on May 13, 1829, aboard the ship John Jay. It had cost the canal company $3,663.30. A nine-horsepower machine capable of hauling 60 tons at a speed of five miles per hour, it ran on four flanged wheels of oak fitted with heavy wrought iron rims. A picture of a lion’s head had been painted on the front of the boiler. The Stourbridge Lion was offloaded at the West Point Foundry’s wharf on the Hudson River at the foot of Beach Street in New York City. According to the Morning Courier and New York Inquirer of June 12, 1829, it was set up on blocks and tested by Horatio Allen. The newspaper reported that it had a horizontal boiler 16-1/2 feet long and two cylinders of three-foot stroke, with the power applied to the wheels about 12 inches from the center. Having passed Allen’s tests, the locomotive was lashed to the deck of the packet Congress on July 16, and brought up the Hudson to Rondout Creek and then through the canal to Honesdale, arriving on August 5. The big worry was that the warped and cracked hemlock stringers topped by strap-iron rails would not hold up, nor would a 30-foot trestle support the seven-ton locomotive. "The impression was very general,” Horatio Allen would later recall, "that the iron monster would either break down the road or that it would leave the track at the curve and plunge into the creek." "Preferring, if we did go down, to go down handsomely and without any evidence of timidity," Allen opened the throttle. On August 8, 1829, history was made. The Stourbridge Lion became the first full-sized locomotive to successfully run on rails in the U.S. Although he didn't know it, Allen had inadvertently become the first American locomotive engineer. The fact that all mention of the America, the first locomotive purchased from the Stephensons, had disappeared from company records long puzzled railroad historians. Only recently the truth was discovered. After having been brought to Honesdale, the America blew up while being tested on July 26, 1829. Then as now, stock companies like the Delaware and Hudson tended to conceal unfavorable news that might cause a plunge in stock prices. Despite Allen’s successful demonstration, the directors of the canal company were afraid to use the new contraption. If the test run had showed anything, it was that the sharper curves and rougher roadbeds in the U.S. were too much for the rigid frames of British locomotives. Horses and mules would pull the heavily laden coal cars from the mines to Honesdale until the canal closed 70 years later. The historic engine was allowed to rust away in a shed alongside the track. Parts of the original, including the boiler, were acquired by the Smithsonian Institution and are now on display at the Baltimore and Ohio Railroad Museum in Baltimore, Ohio. A century after Horatio Allen's short-lived demonstration of steam power, the Delaware and Hudson Railroad, the canal’s successor, constructed an exact replica of the Stourbridge Lion in its Colonie, N.Y., shops and exhibited it at the Chicago Century of Progress Exposition in 1933. Today that same Stourbridge Lion is on display at the Wayne County Historical Society's museum in the D and H’s former office building in Honesdale. Quite properly, this attractive little Pennsylvania town calls itself "the birthplace of the American railroad."